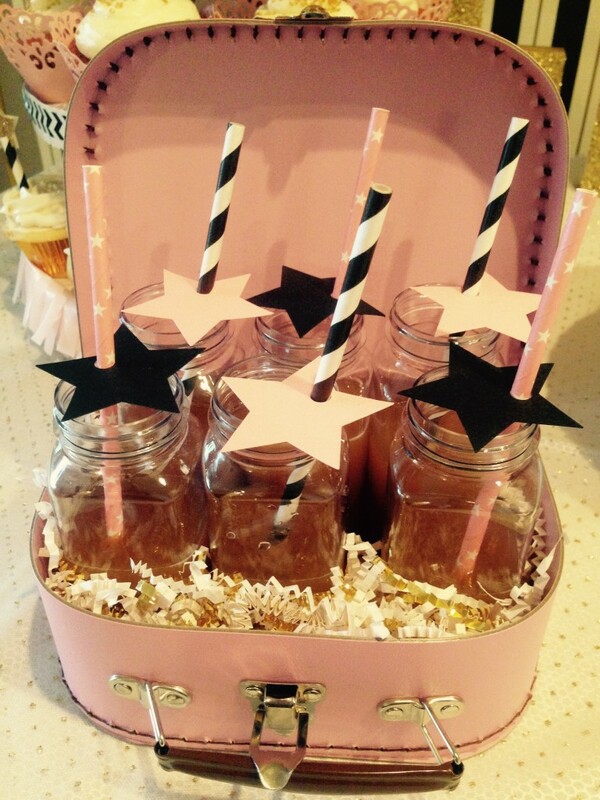 I was looking for a theme for Emma's birthday, and liked the Twinkle little Star Idea, and the Gold and Pink combination. Decided to add the Black and White to make it more elegance and give it an extra kick. Stripes Background are actually Table Wrapping Paper from Paper Source. I wanted to cover the huge Ikea EXPEDIT in our dining room, and it perfectly worked. Party Fan also from Paper Source. Suitcases and Cake Stands from Amazon. Juice Bottles from Shop Sweet Lulu. Cupcake, Cookies and Rice Krispies are hand made. EMMA letters, stars mobile and strings, invitation, wreath are DIY. I love the suitcases with the Rice Krispies, and the B&W strips background. I start planning few months ahead, so I had enough time to make all the DIY stuff and order everything I need without getting stressed.